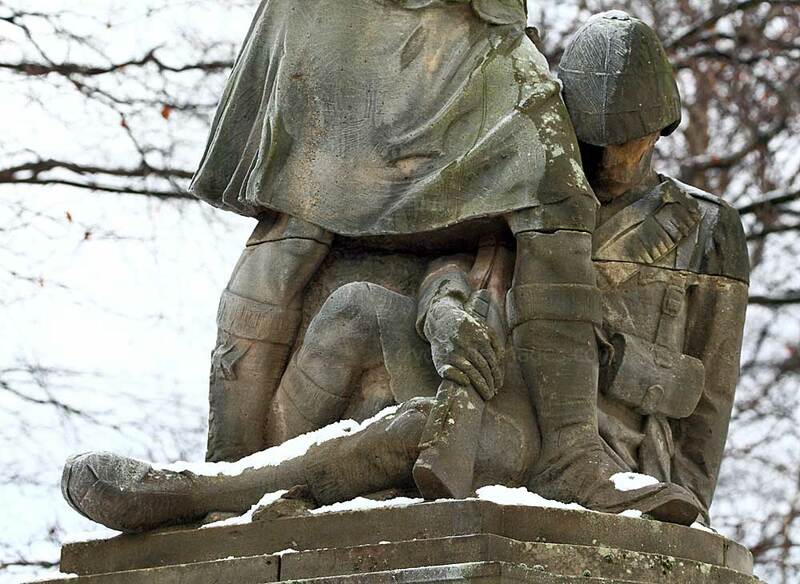 I have a large collection of War Memorial images, both in the UK and abroad and this section is due to be revamped with memorials listed in their respective regional locations. Please bear in mind that all my images are subject to copyright. They are not free to use and have been embedded with a digital watermark. Alloa lies 9 km (5.5 miles) east of Stirling on the north bank of the Forth close to where the River Forth widens to become the Firth of Forth. ​The town is the administrative centre of Clackmannanshire Council and historically, Alloa`s economy relied heavily on trade between Glasgow and mainland Europe via its port. This became increasingly less profitable and the port stopped operating in 1970. 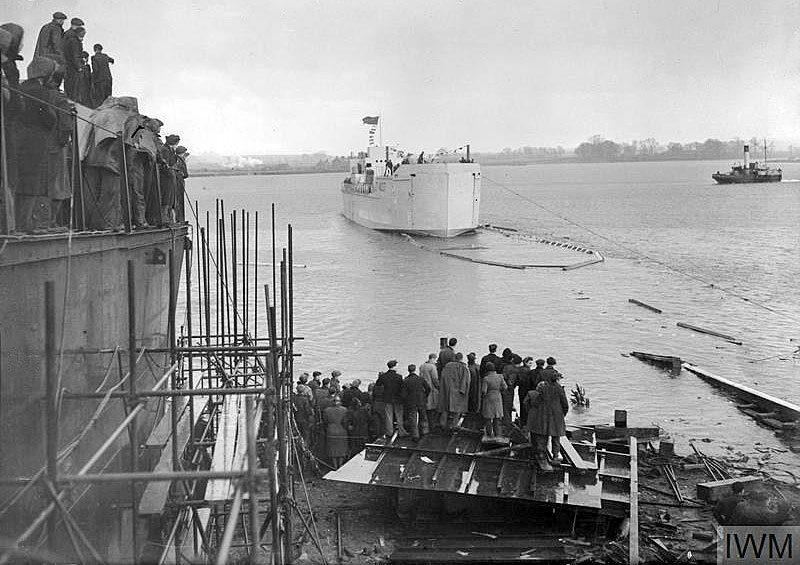 ​Pictured above is the first of a new class of Tank Landing Craft LC(T) 4037, later renamed Rampart, going down the slipway at Alloa on 13 February 1945 after launch by Commander Earl Beatty, DSC, RN. 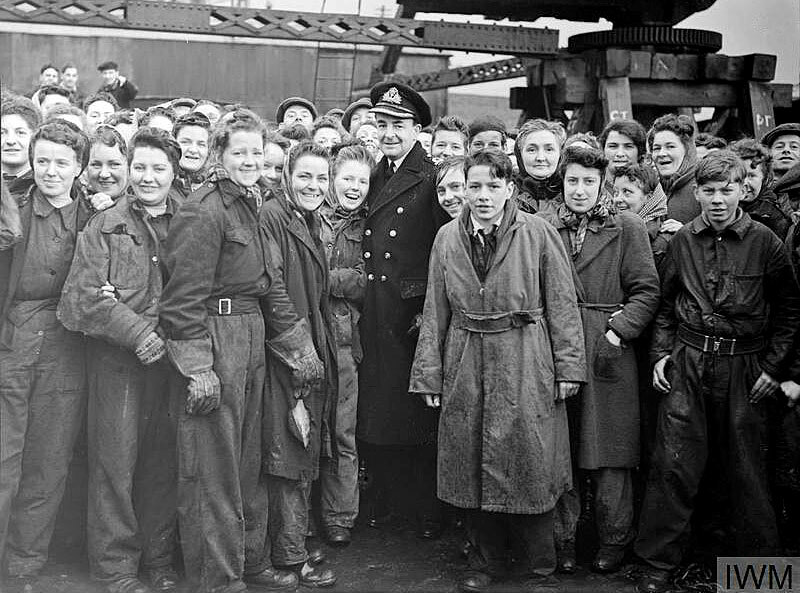 The Commander is pictured on the right, talking to some of the workers who built her. The most famous building in the town is the Alloa Tower, one of the largest free-standing tower houses in Scotland. It was the ancestral home of the powerful Erskine family who are Earls of Mar and Kellie. The tower is open to the public and contains displays from the Earl of Mar's personal collection. 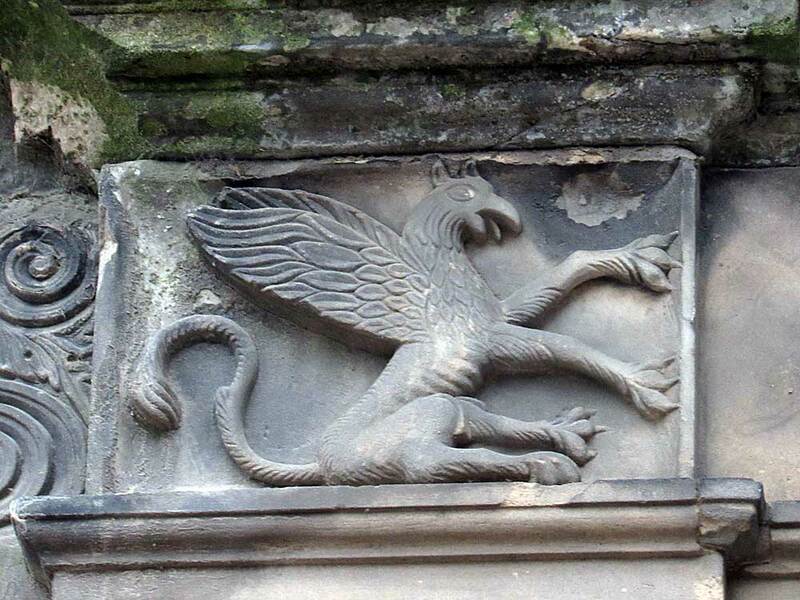 ​The Earls of Mar were powerful Lords who have played a prominent role in Scottish history while The Erskines were trusted aides to the Stuart kings of Scotland and guardians of the royal children. John Erskine, the 6th Earl, was a signatory to the Treaty of Union and one of the instigators of the 1715 Jacobite uprising. 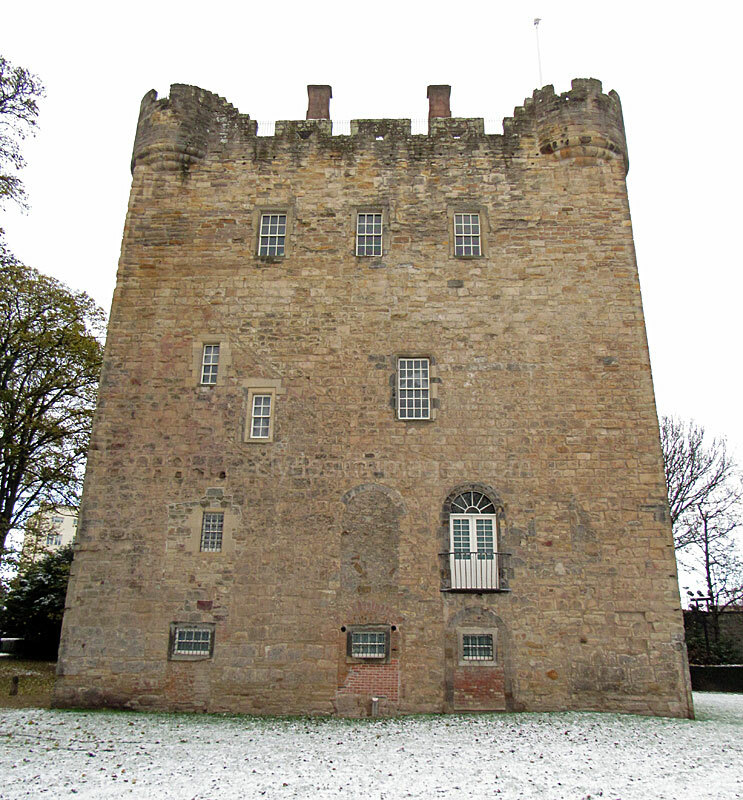 Alloa Tower dates from around 1368 and was strategically positioned to protect a ferry crossing on the River Forth. 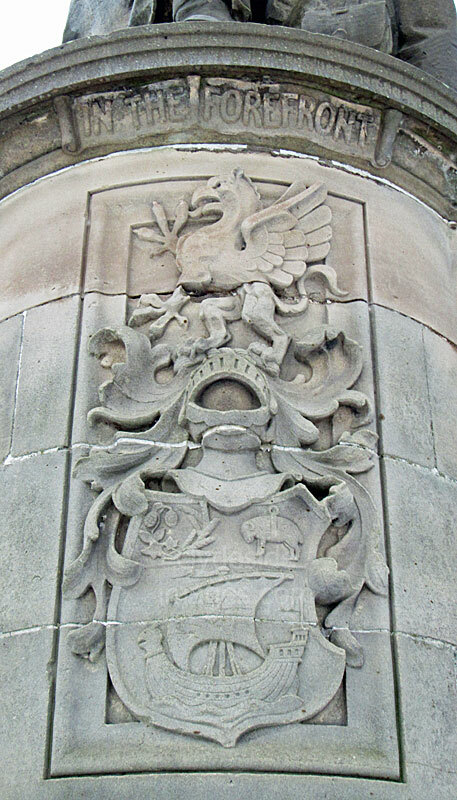 The first Earl to stay at the tower was Sir Robert Erskine who had served as the great Chamberlain of Scotland in 1360. ​The structure has been altered and upgraded several times over the years including in 1680 when Charles Erskine, 5th Earl of Mar, added a mansion house to the side. 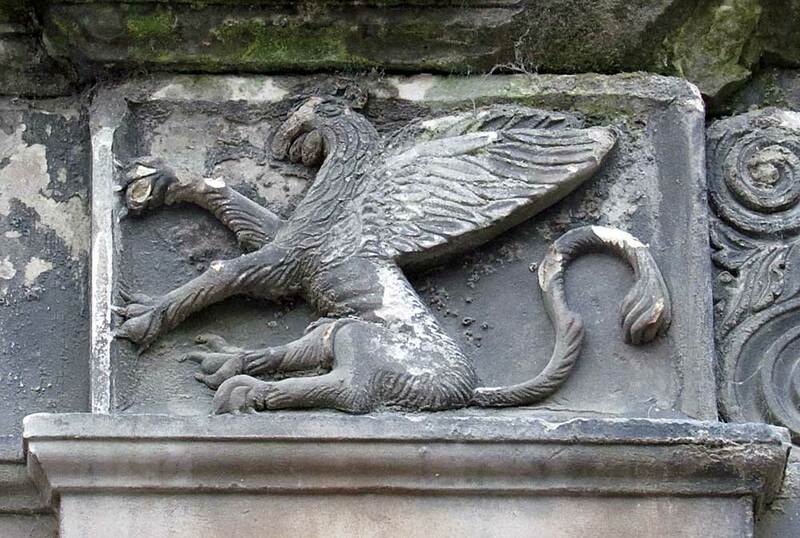 Tragically the mansion house burned down in 1801, killing Lady Erskine in the process after which it was left to decay and Dragoons later used the ruins to stable their horses. 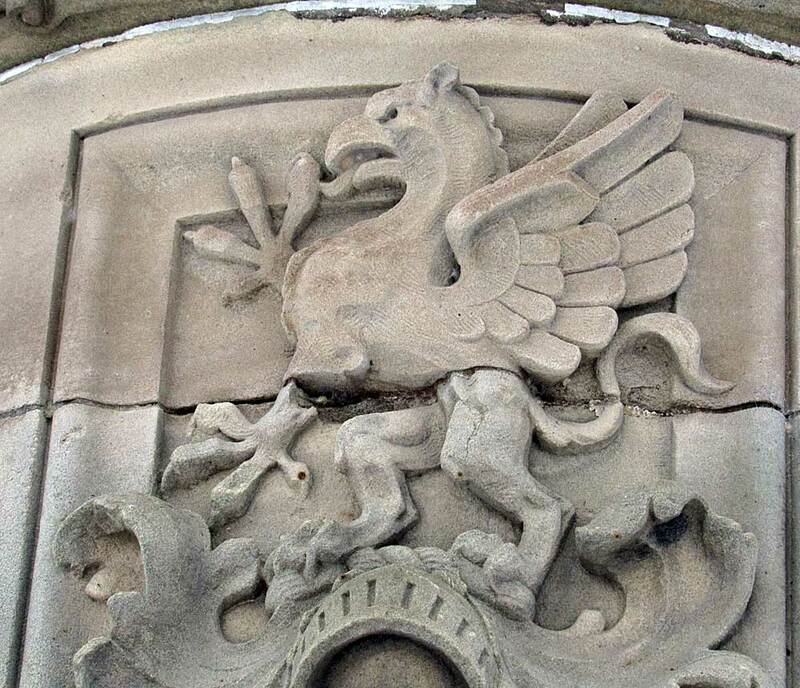 The tower was rebuilt 38 years later, but the last remnants of the mansion house were cleared away in the 1960s. 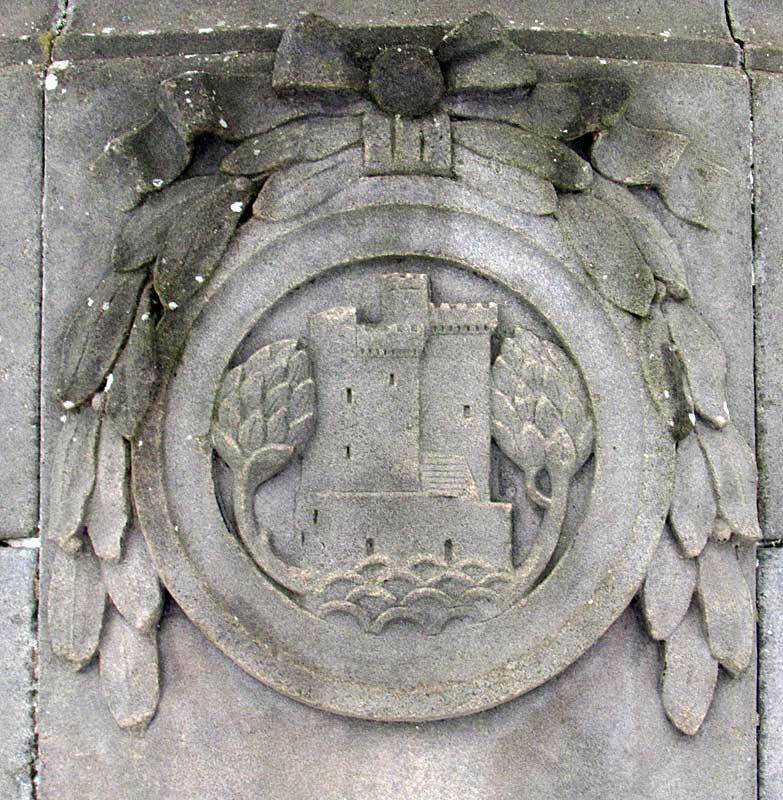 The castle remained in the Erskine family until 1988 when James Erskine, 14th Earl of Mar, put the tower into a trust for restoration and public access. Clackmannanshire Council and the National Trust undertook and lengthy and detailed restoration project that lasted for eight years and today the tower is open to the public. 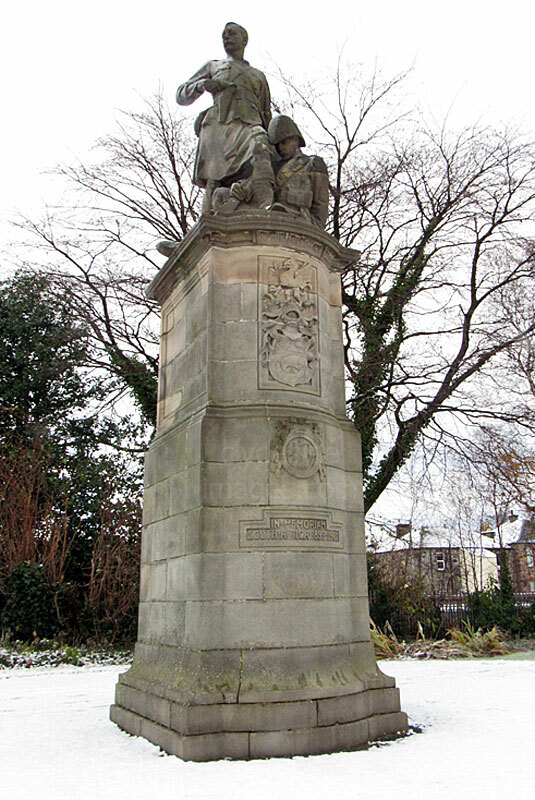 Alloa has two major war memorials. 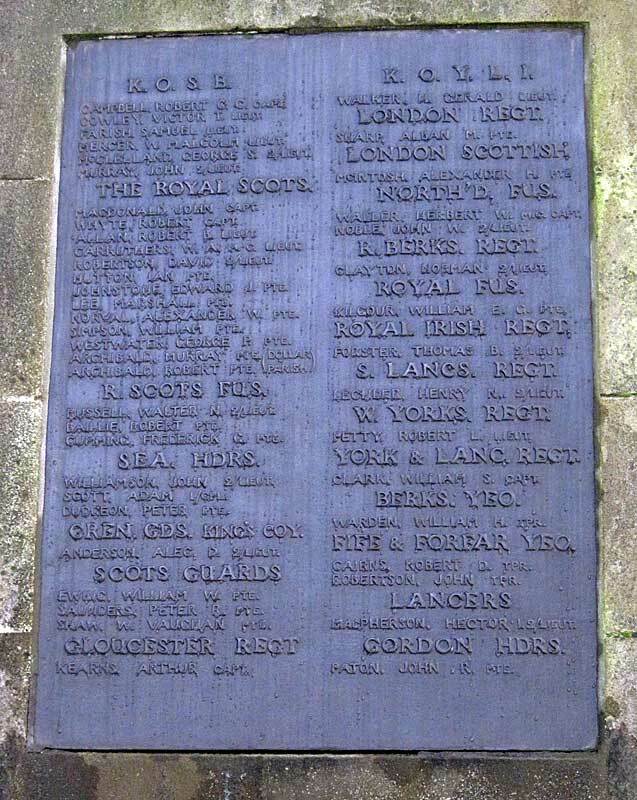 This one (above) honours the men who fell in the Great War, and also lists the town`s WW2 dead military personnel, plus casualties from later conflicts. 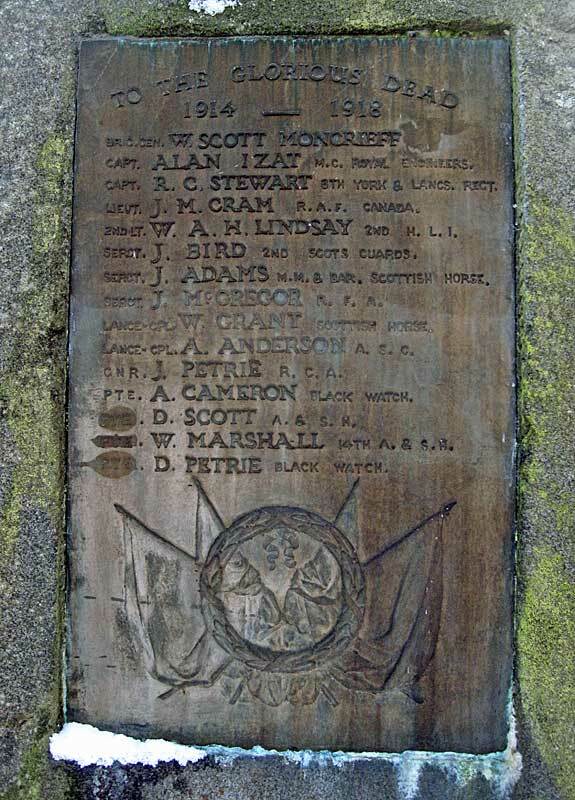 It was unveiled on Sunday 28th September 1924 and a Book of Remembrance was also lodged in the Library. 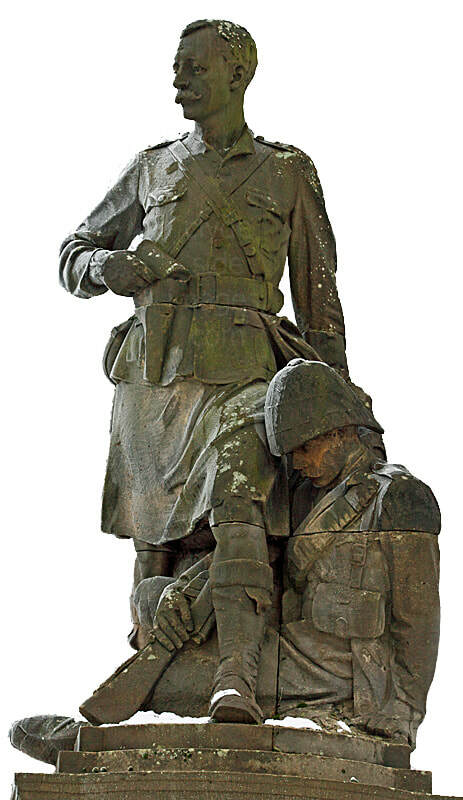 The other memorial relates to the Boer War (see below). 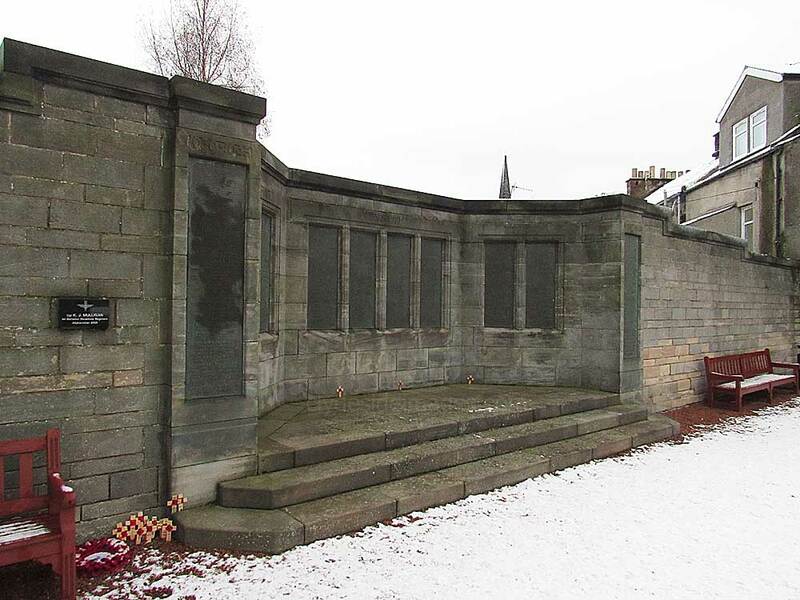 Alloa`s main memorial is one of many by the renowned architect and sculptor Charles D`Orville Pilkington Jackson ARSA, FRBS, FRSA (11 October 1887 – 20 September 1973) whose works include Tillycoultry`s WW2 Garden of Remembrance, the Devonvale Mills War Memorial at Tillycoultry (see below), the Robert the Bruce Statue at Bannockburn and the Scottish National War Memorial at Edinburgh Castle for which he was appointed supervising sculptor. The site comprises memorial gardens bounded by a high stone wall to the north and low curved stone walls with railings on the other three sides. 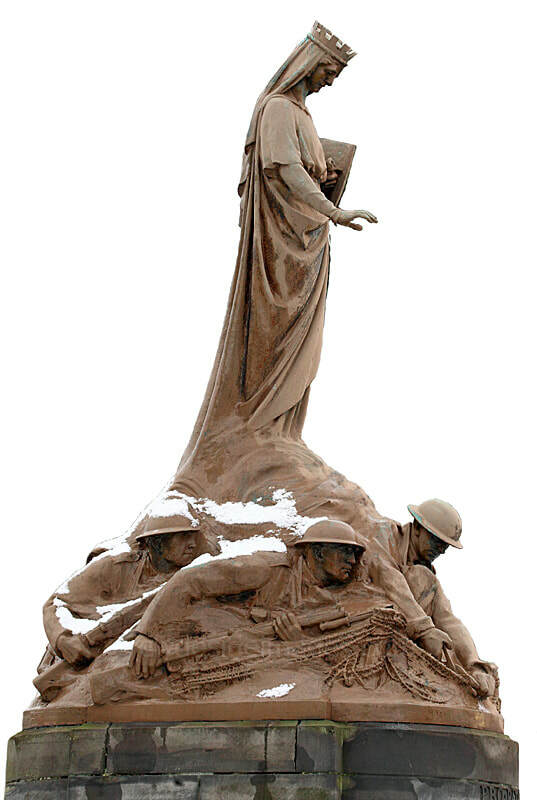 The memorial, which is in the centre of the grounds, has the figure of St Margaret, crowned and robed, standing over a group of three soldiers who are attempting to advance through muddy terrain. The lead lead figure, wearing gloves, is about to cut a length of barbed wire with heavy wire cutters. 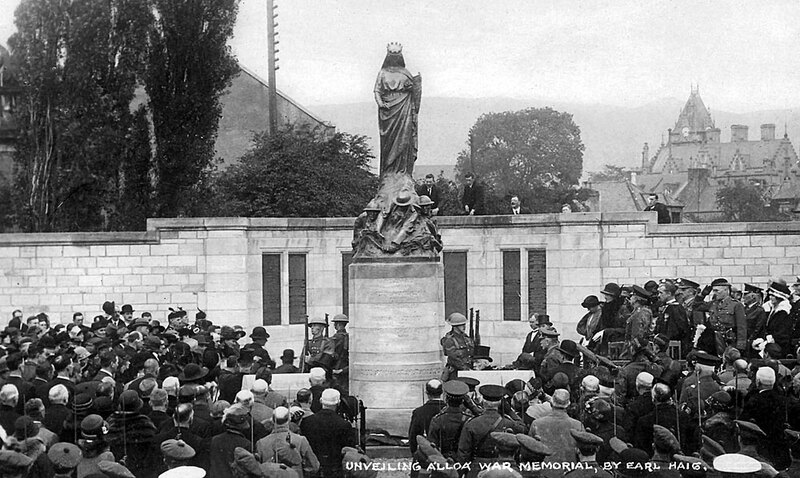 This remarkable old postcard shows the unveiling ceremony attend by Earl Haig who can be seen side-on, to the right of the memorial. 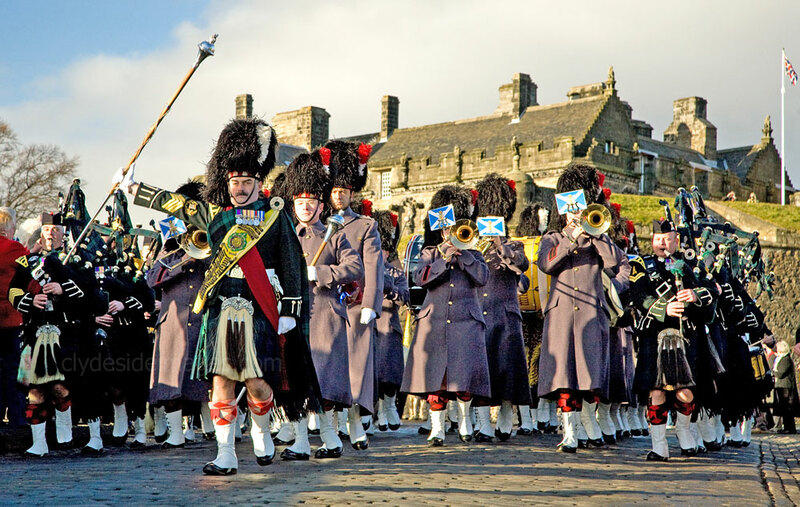 Historically Alloa has a strong association with the Argyll and Sutherland Highlanders who were housed nearby, at Stirling Castle. These images from the Imperial War Museum`s collection show troops of the 2nd Battalion Argyll and Sutherland Highlanders in the Bois Grenier Sector, France, in March-June 1915. 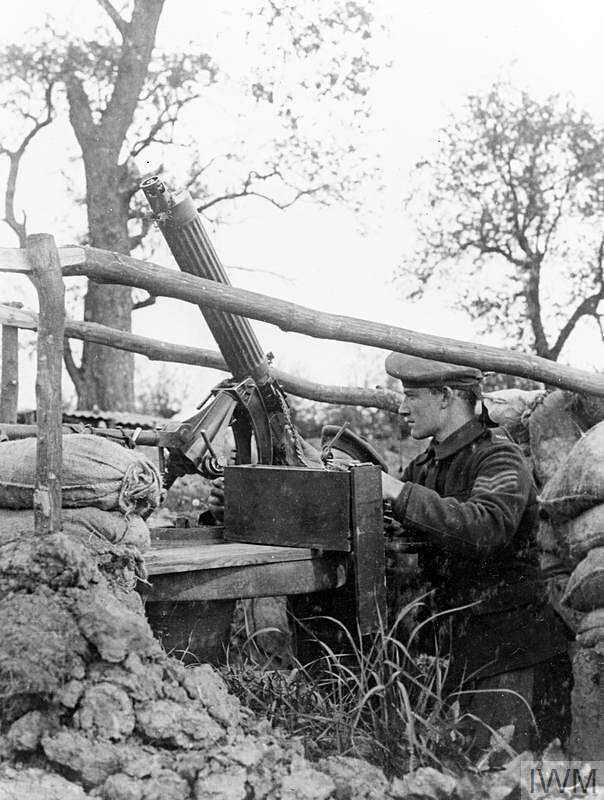 ​They feature 2nd Lieutenant Albert Methuen Bankier sniping, Company Sergeant-Major James Henderson in furs, an unidentified Gunner officer covering Battalion, on forward observation duty, and a Sergeant manning an anti-aircraft machine gun. 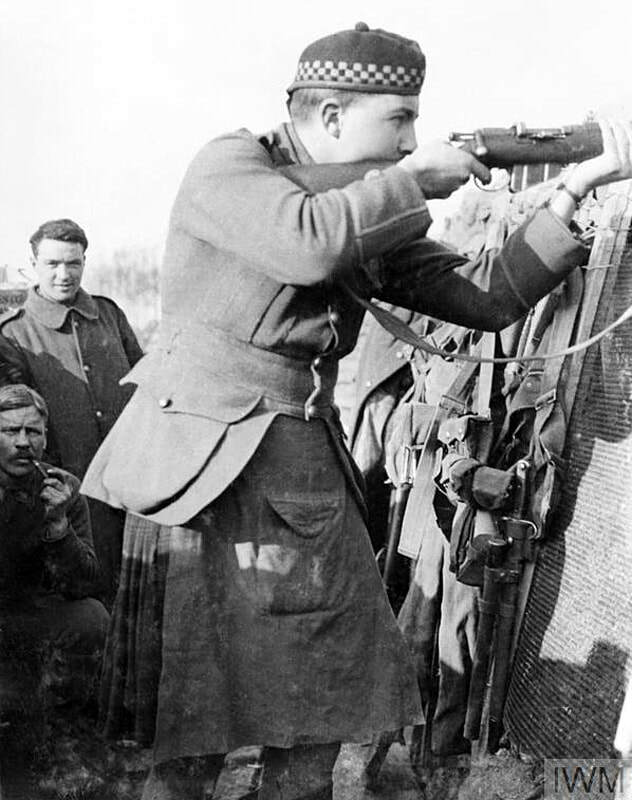 The Argyll & Sutherland Highlanders, like other regiments of the British Army, have a long list of Battle Honours including those from the First World War. 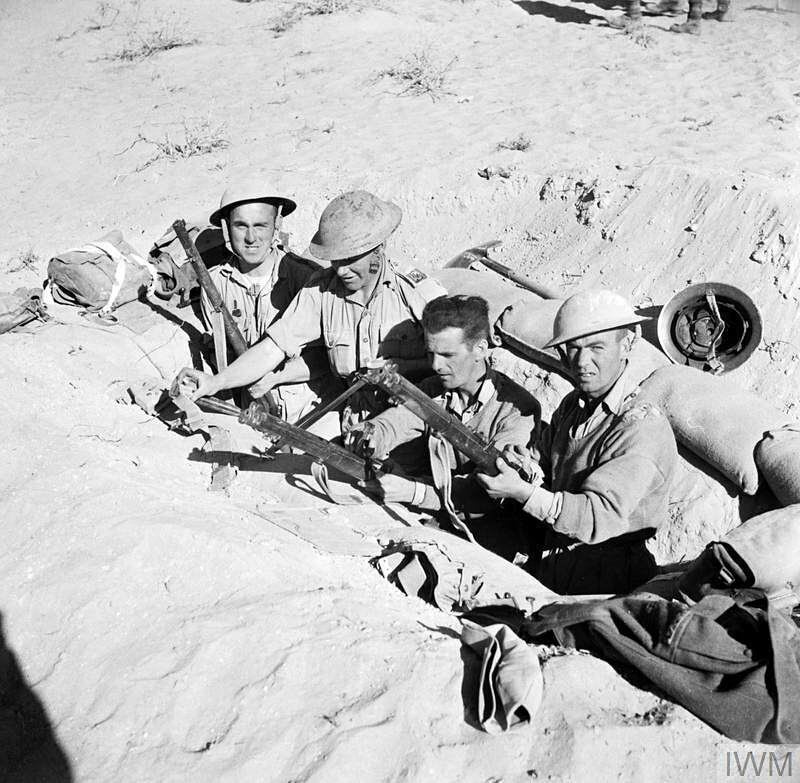 Many of this regiment`s soldiers fought under Montgomery at the Second Battle of El Alamein, Egypt, (23 Oct 1942 – 5 Nov 1942) one of the most decisive clashes of World War 2. 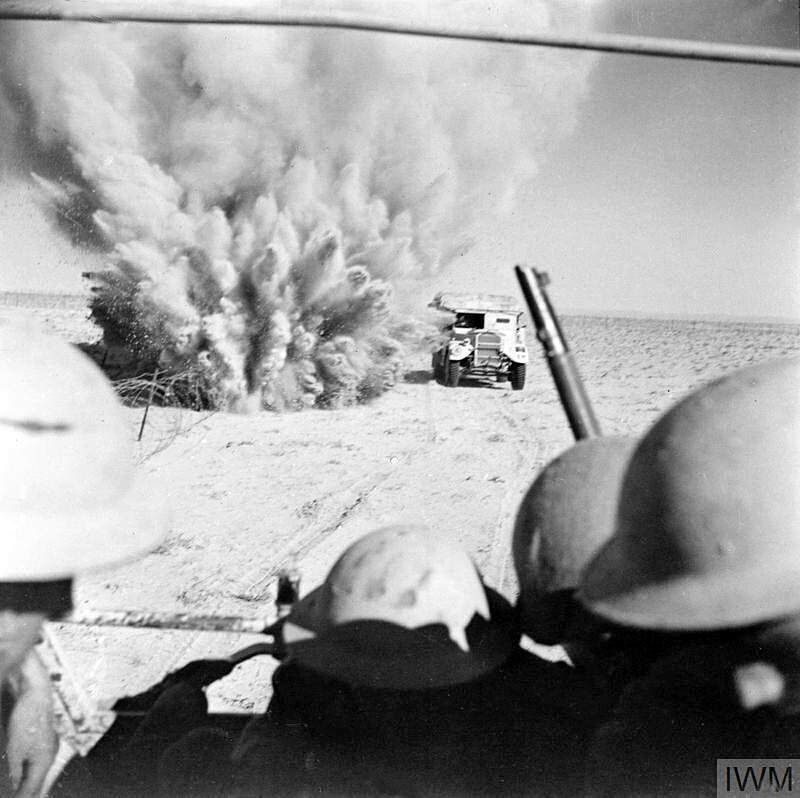 At Wadi Akrit, Tunisia, between 6–7 April 1943, the 7th Battalion, Argyll and Sutherland Highlanders (Princess Louise's) formed part of the 51st Highland Division. 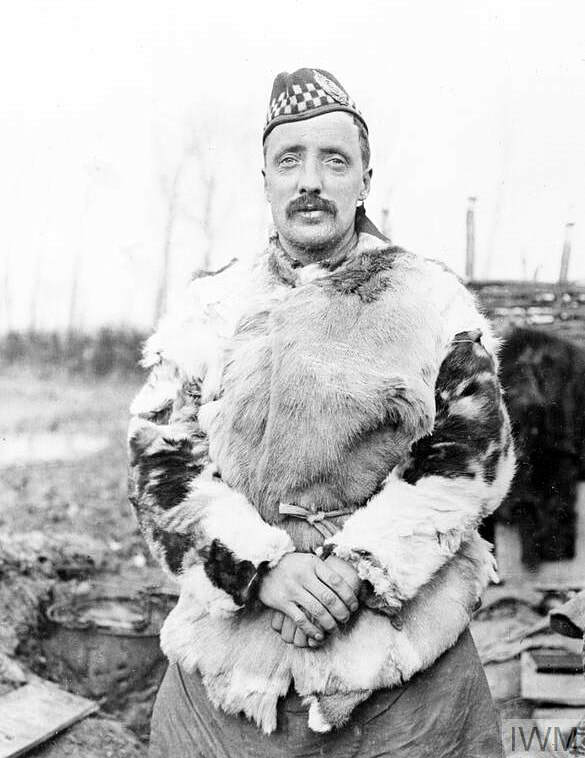 The regiment`s commanding officer, temporary Lieutenant Colonel Lorne Campbell, then 40 years old, won a V.C. 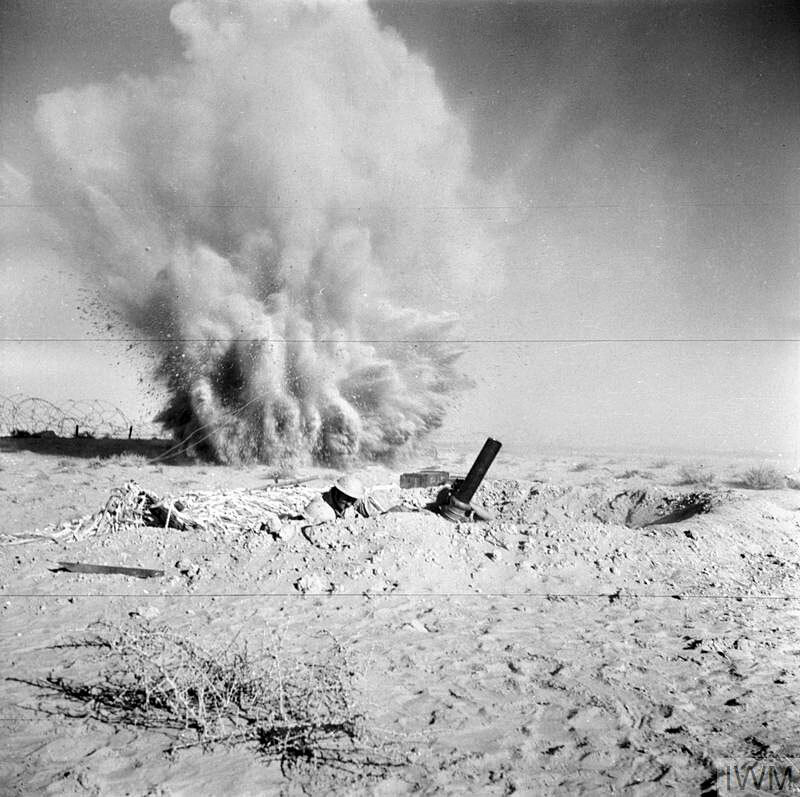 The above image shows men of the 51st near El Alamein in October 1942. 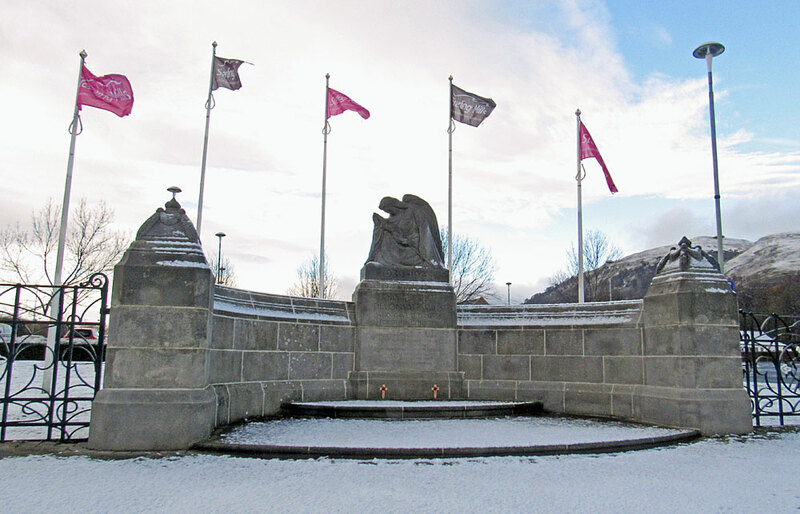 The panels on the wall at the rear of the memorial contain the names of those who died during the First and Second World Wars. Some personal tributes and a plaque to Corporal K.J. 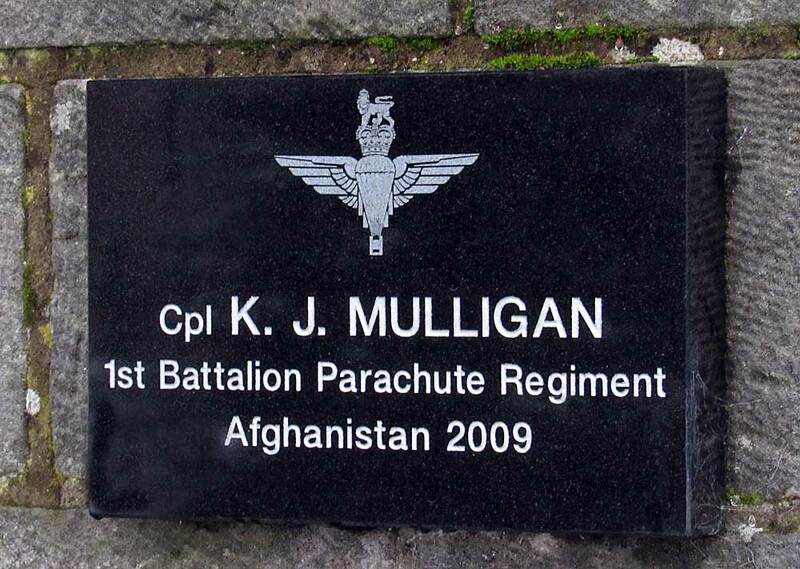 Mulligan of the 1st Battalion Parachute Regiment who was killed on active service in Afghanistan in 2009. 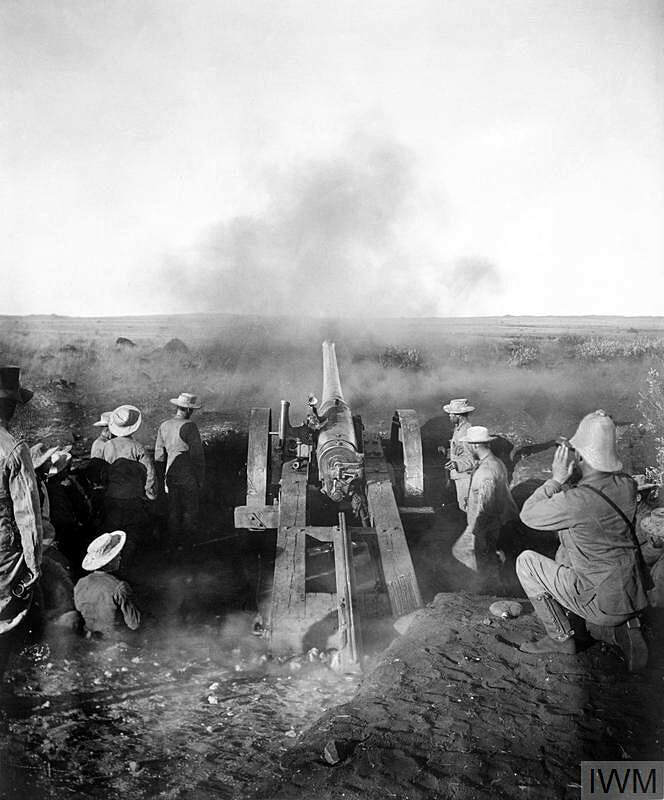 Boer War (11 October 1899 – 31 May 1902). 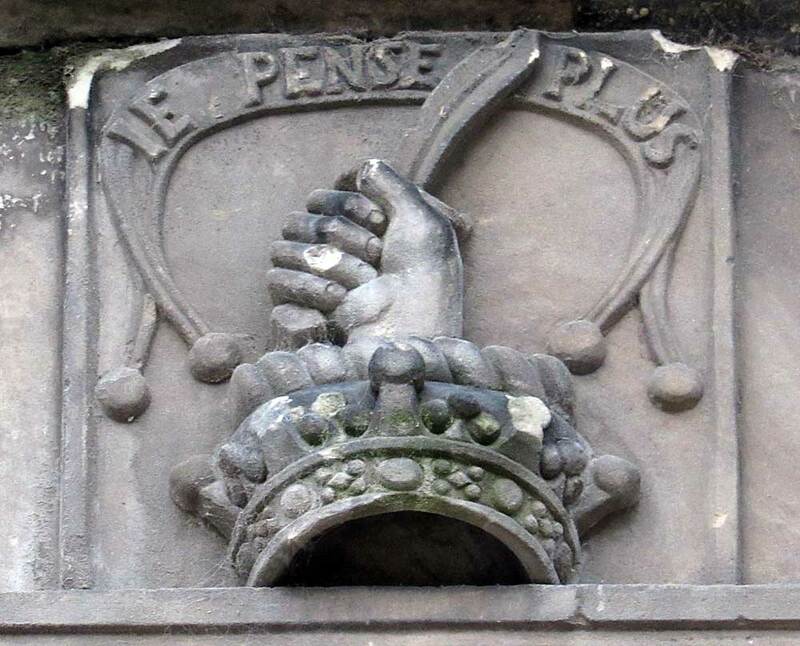 The phrase `IN THE FOREFRONT` has been carved below the figures. 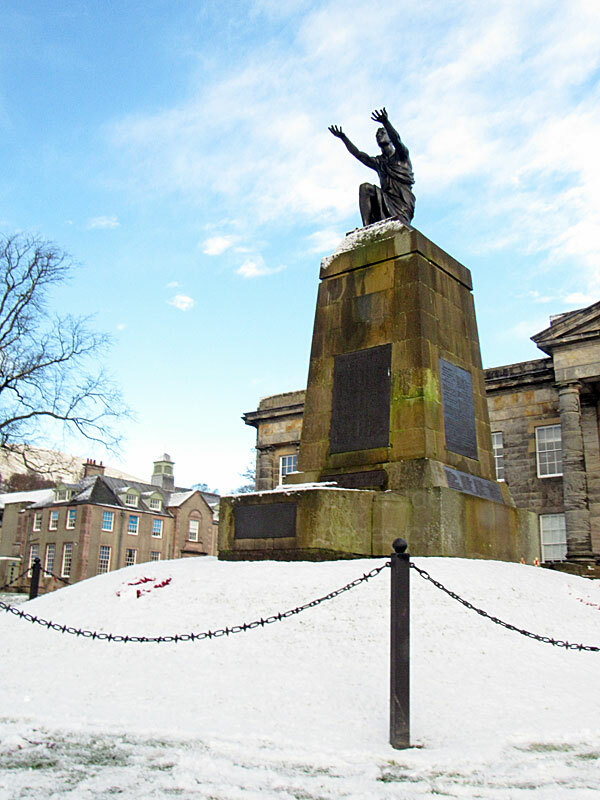 Two prominent people were involved in the monument’s creation, namely the architect Sir Robert Lorimer who was responsible for the design and the sculptor William Birnie Rhind who did the figures. 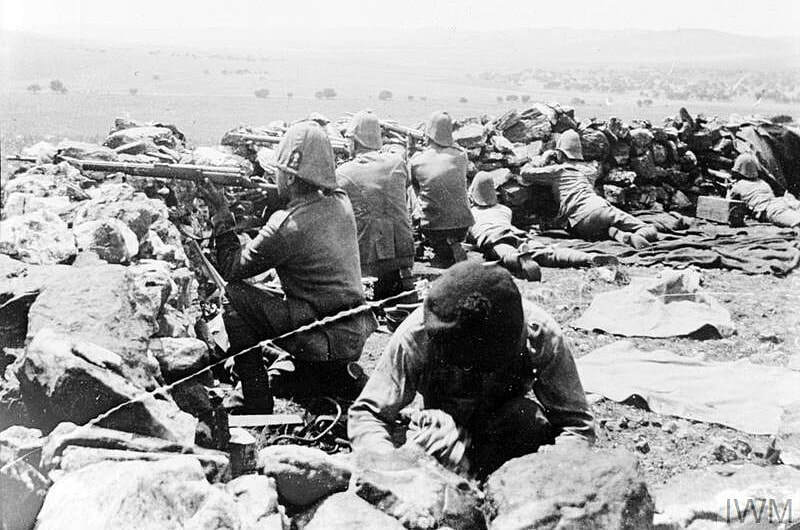 The Second Boer War, also known as the Anglo-Boer War or South African War, was fought between the British Empire and two Boer states, namely the South African Republic (Republic of Transvaal) and the Orange Free State. The British were initially arrogantly overconfident and unprepared to match such a determined and clever enemy. 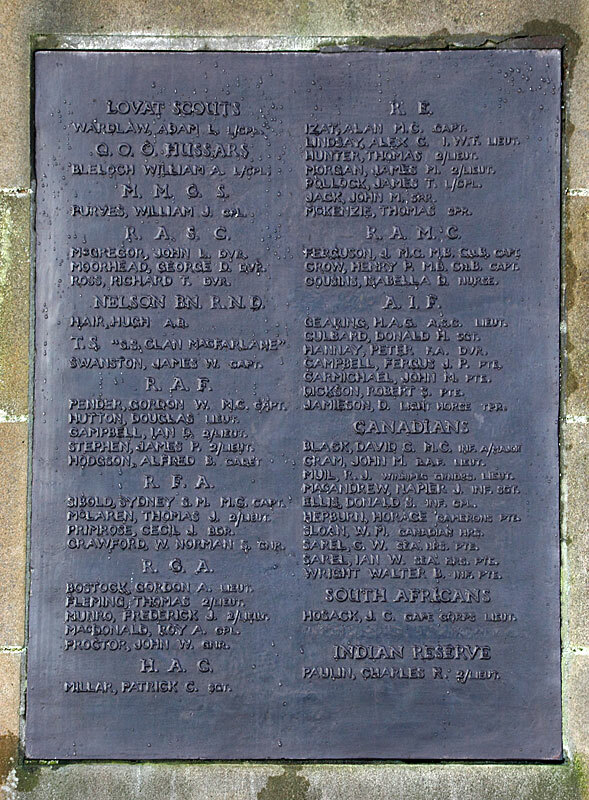 The Boers immediately besieged Ladysmith, Kimberley, and Mafeking and were victorious in several major battles. 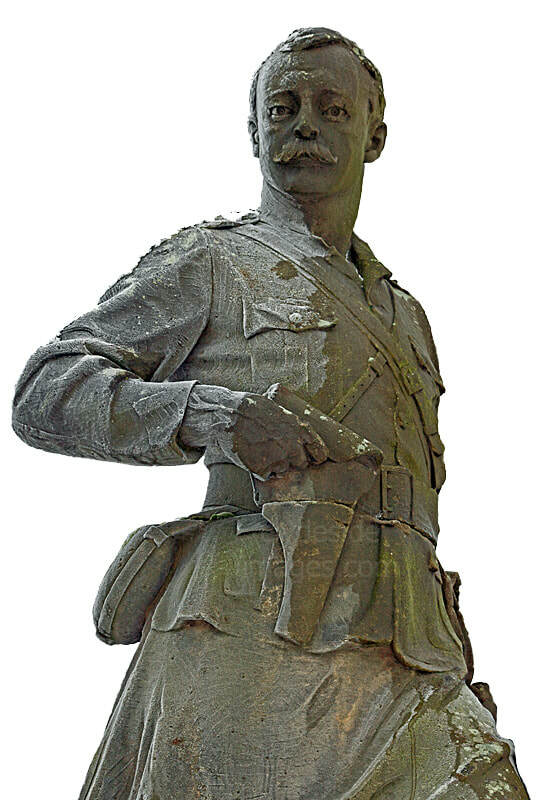 General Redvers Buller was replaced by Lord Roberts and Lord Kitchener and the British shipped-in thousands of reinforcements, relieved the three besieged cities, and invaded the two Boer republics. ​Faced with such overwhelming odds, the Boers adopted guerrilla tactics and refused to surrender. Generals Louis Botha, Jan Smuts, Christiaan de Wet and Koos de la Rey frustrated the British with surprise attacks and ambushes for a further two years. Civilian farmers and their families in the region, most of whom were sympathetic to the Boer cause, were relocated into concentration camps, where many, especially children, died of disease. 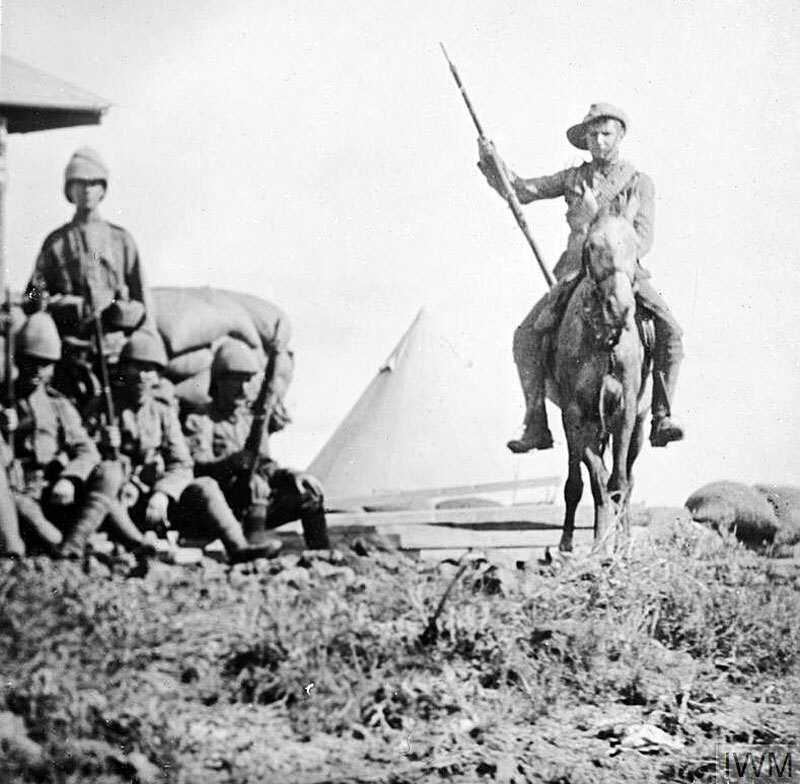 British mounted infantry units gained hard won experience and systematically tracked down the highly mobile enemy units, eventually forcing the Boers to surrender. Hostilities ended after the Treaty of Vereeniging was signed in May 1902. ​The British successfully won over the Boer leaders, who now gave full support to the new political system. Both former republics were incorporated into the Union of South Africa in 1910, which Boers controlled. 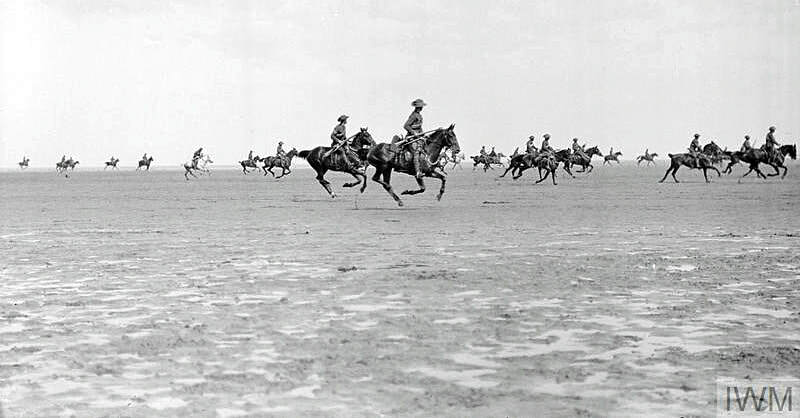 Left: Troopers of the Lothian and Border Horse Yeomanry in action. Losses sustained by the British Empire were thought to be in excess of 22,000 dead, 900 missing with 22,000 wounded. 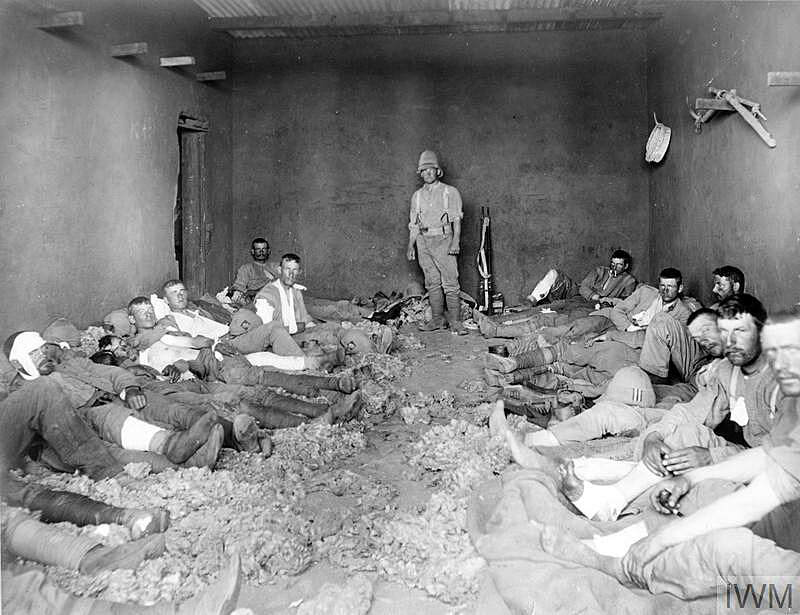 Over 6,000 Boer fighters died with 24,000 others being sent overseas. Civilian casualties incurred were over 46,000 with almost 26,500 of them being Boer women and children who died in the camps. A large number of black Africans also perished. 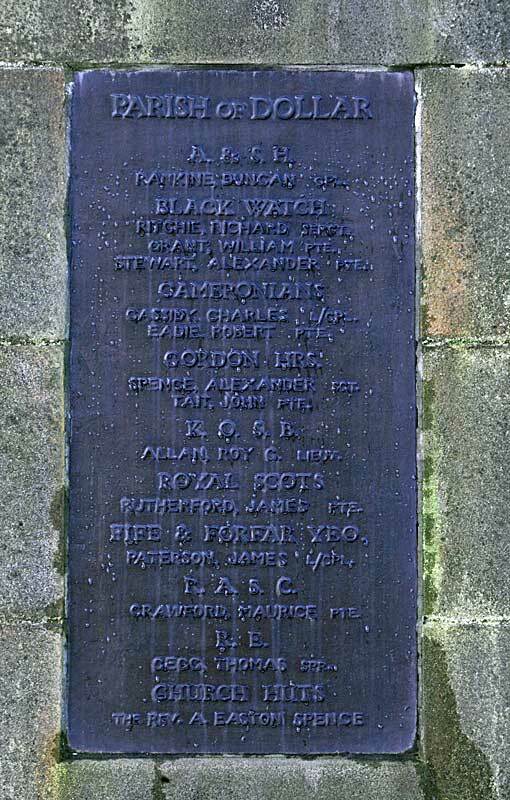 The men listed on Alloa`s Boer War memorial served in a variety of units including the Kimberley Light Horse, 16th Queen's Lancers, 18th Hussars, 2nd Dragoons, King's Own Scottish Borderers, Highland Light Infantry, 2nd Battalion, (Black Watch) Royal Highlanders. Argyll and Sutherland Highlanders, No. 1 Troop, Protectorate Regiment and the Transvaal Constabulary. 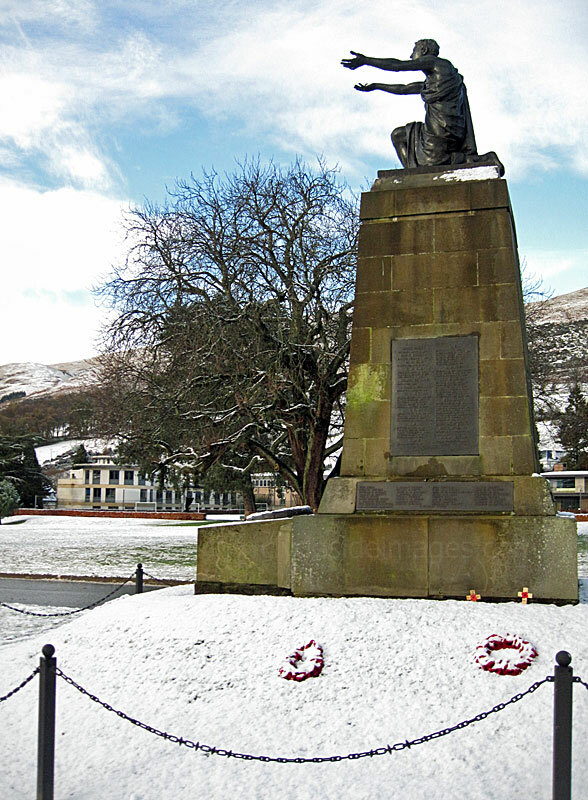 Dollar is a small town in Clackmannanshire, although it is classed as one of the Hillfoots Villages, situated between the Ochil Hills to the north and the River Devon to the south. Dollar is on the A91 road, which is a main route between Stirling and St Andrews. 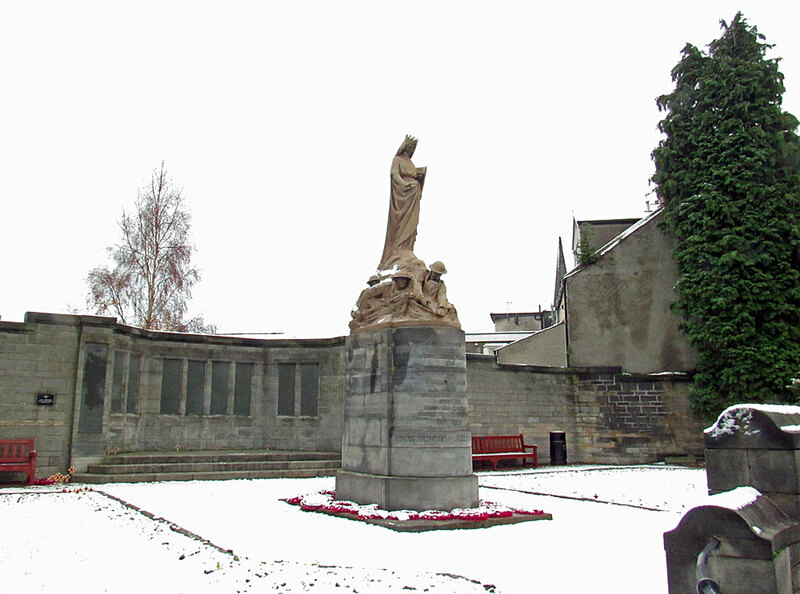 There are two main memorials in the town. Dollar Academy, founded in 1818 by benefaction of trader John McNabb, is an independent co-educational day and boarding school. 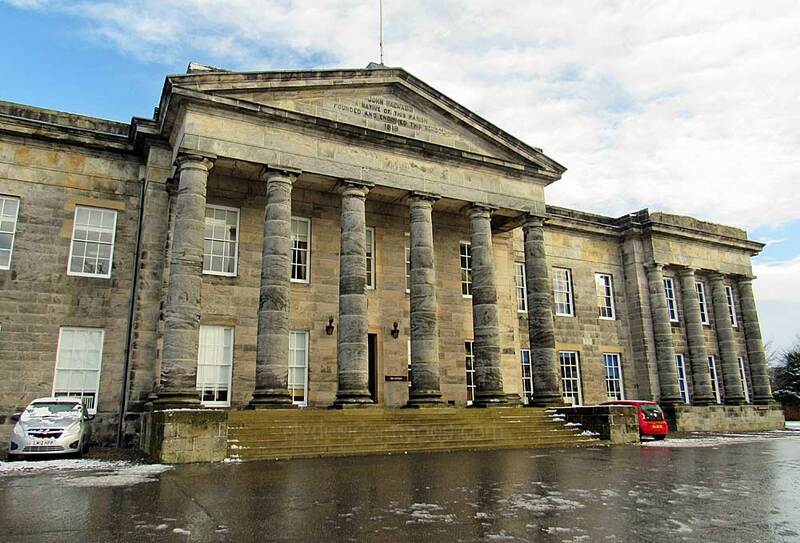 The open campus occupies a site in the centre of the town of Dollar in Central Scotland. 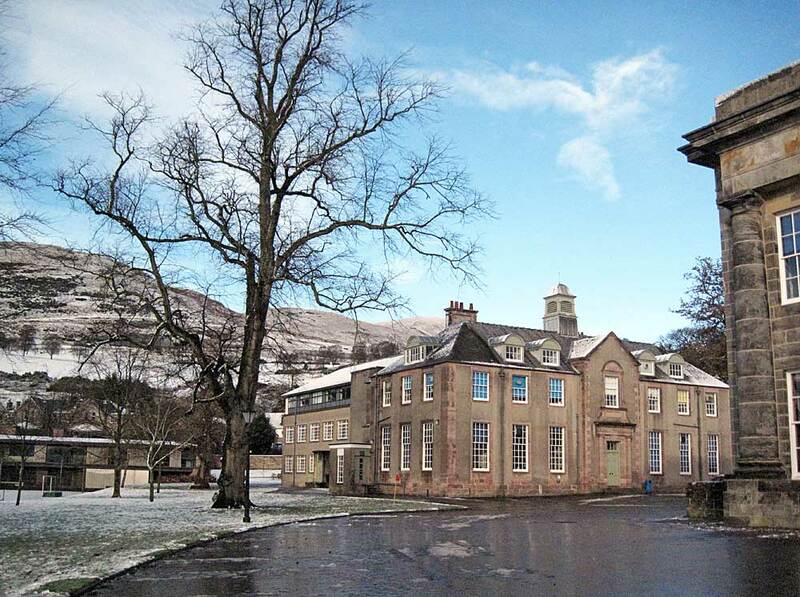 The school lies at the foot of the Ochil Hills and is surrounded by Clackmannanshire countryside. ​Paulin was born nearby, at Muckhart, and his artistic talent became apparent while he was a pupil at the Academy. He went on to study at Edinburgh College of Art where he gained a diploma in sculpture, as well as a travelling scholarship to Paris and Rome. 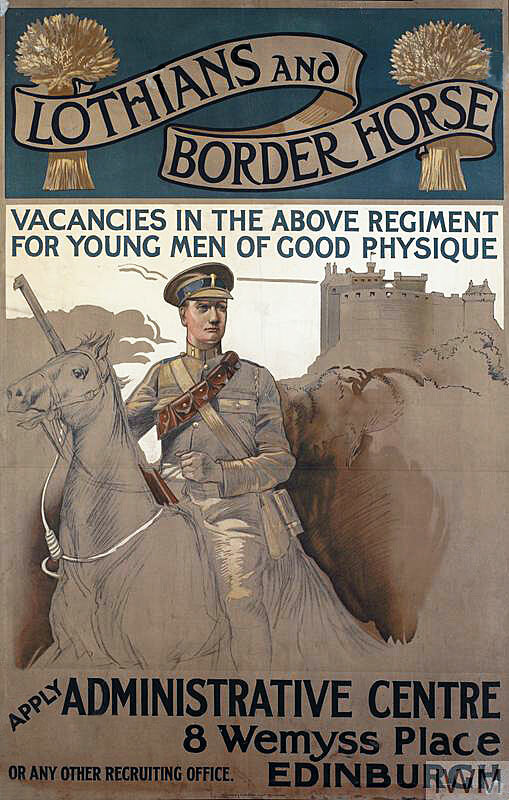 ​Shortly after war broke out, he returned to Scotland and enlisted as a trooper in the Lothian and Borders Horse Regiment. 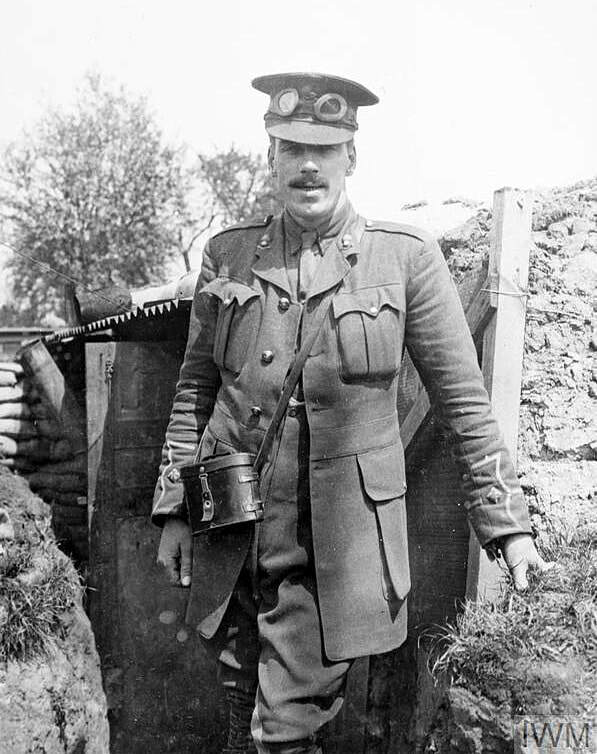 In November 1914, however, he was trampled and seriously injured by a horse which resulted in one of his kidneys being removed. ​Although he was invalided out of the army before the end of the year, he later re-enlisted, this time as an officer in the Royal Flying Corps. He soon reached the rank of Captain and in January 1918, he transferred to the Royal Naval Air Service as a Lieutenant. However, before hostilities ceased the RNAS was incorporated in the newly formed Royal Air Force. When the War finally ended talented sculptors were in great demand as memorials were being erected all over the UK and abroad to honour those who gave their lives during the conflict. In 1919, Paulin set up a studio in Buccleuch Street, Glasgow, and received numerous commissions for war memorials, the one at Kirkcudbright being one of his first major works. 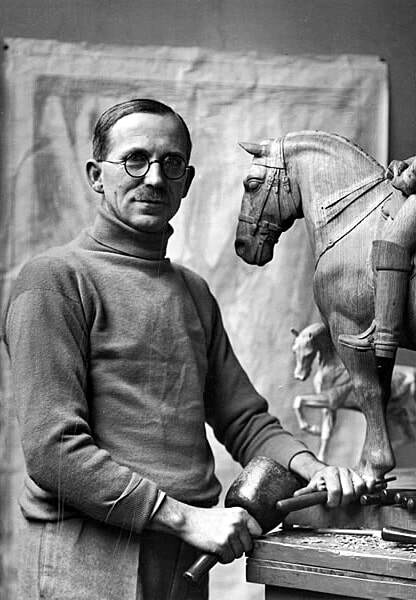 Rather than mark his sculptures with his full name they were usually just signed `GHP'. 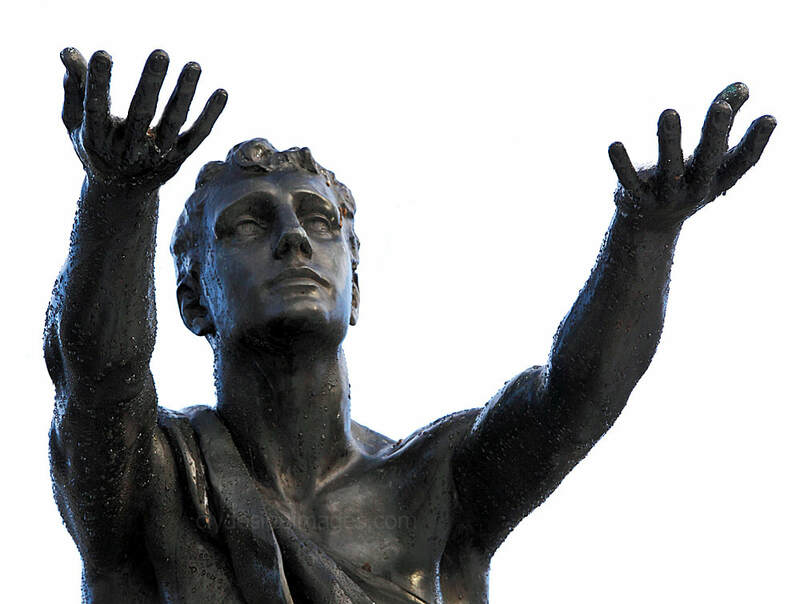 Although it has been suggested that Paulin based the memorial`s figure on his brother Second Lieutenant Charles Paulin, who was killed during the Great War, there is no evidence to substantiate this. 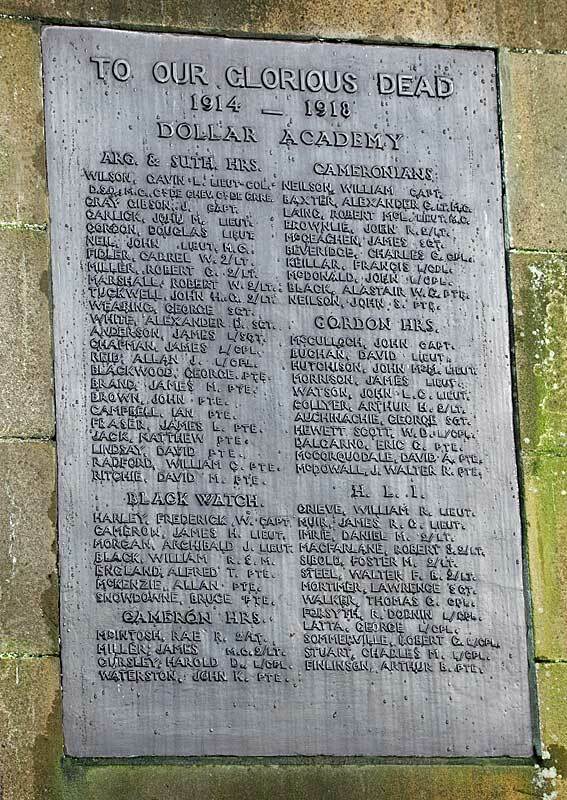 Charles was also a former pupil at the Academy and his name is among those included on the Roll of Honour. 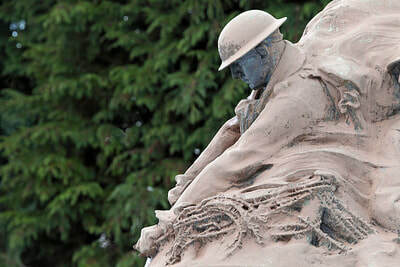 Paulin`s other Scottish Great War Memorials include those at Milngavie, Rutherglen and Kirkcaldy. 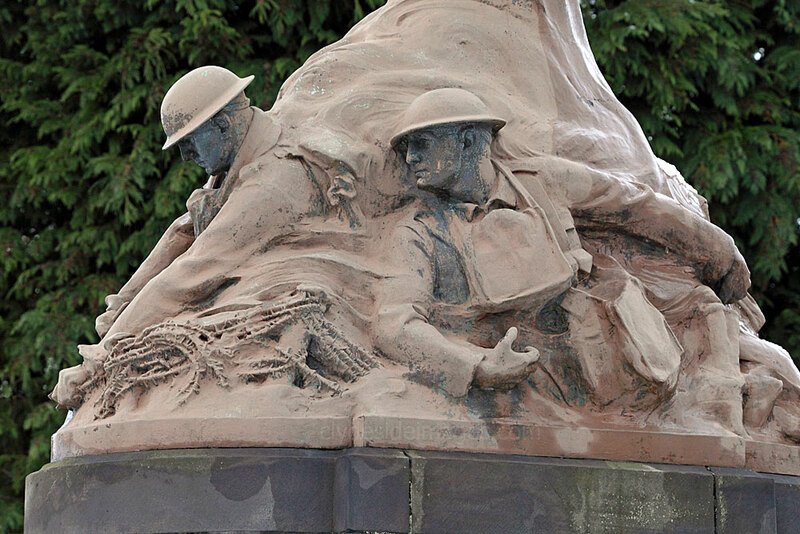 The quality of his work lead to Paulin being commissioned to create major monuments on the Western Front, most notably that to the 51st (Highland) Division sited in the Newfoundland Memorial Park at Beaumont-Hamel on the Somme. 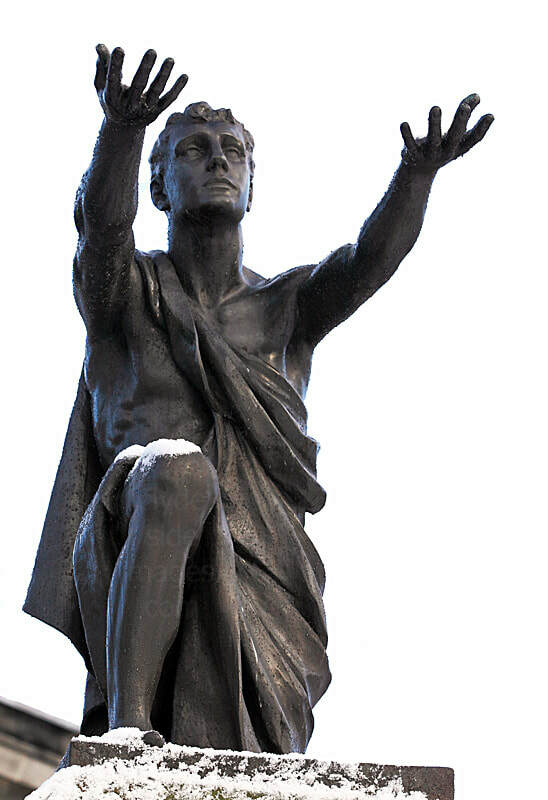 In 1945 he was commissioned by the US Navy to create a memorial for Dumfries-born father of the Navy John Paul Jones. After World War II, Paulin also designed the Dollar War Memorial (not yet photographed) which is sited in the Memorial Gardens between Bridge Street, Henderson Place and Devon Road, towards the eastern end of the town. 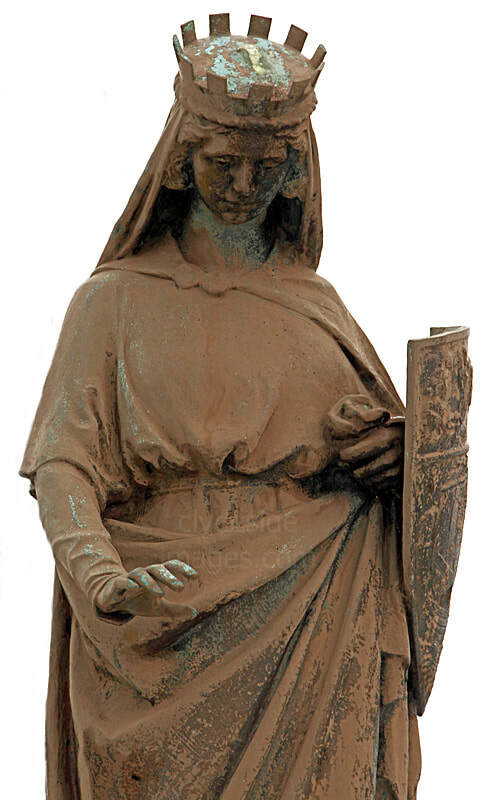 Unveiled in 1947, it is made from natural stone unearthed during open cast mining operations and has a distinctive large bronze sword of sacrifice on its south-east face. 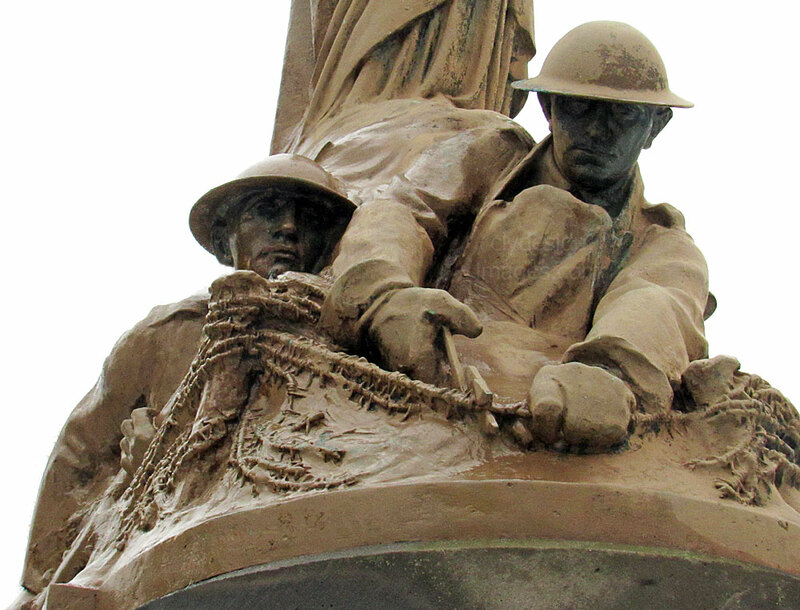 The Coalsnaughton war memorial, unveiled 1920, was also designed by him. Muckhart commonly refers to two small villages in Clackmannanshire, Pool of Muckhart and Yetts o' Muckhart. 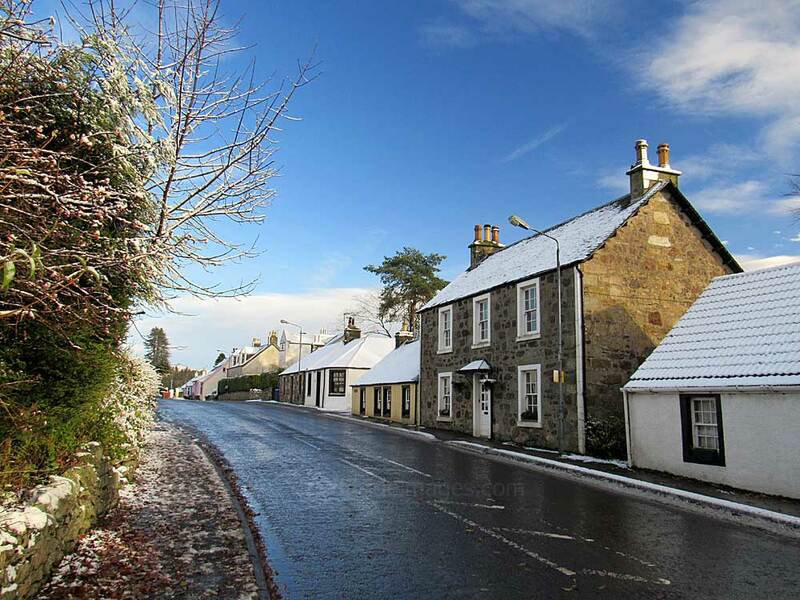 Muckhart is one of the Hillfoots Villages, situated on the A91 around 3 miles north-east of Dollar. The Gaelic name, Muc-àird, comes from 'muc' (Pig) + 'àird' (Height), and may derive from the fact that the surrounding fields may once have been used for pig farming. Muckhart, together with Glendevon, used to form the southernmost tip of Perthshire but was transferred to Clackmannanshire in a reorganisation of boundaries in 1971. 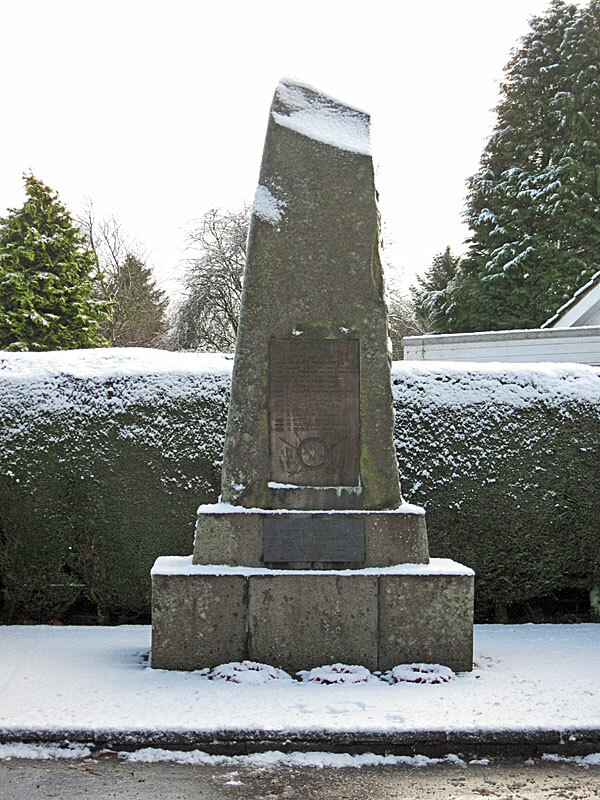 The Muckhart War memorial is situated next to the Coronation Hall in the village and occupies a small site bounded on three sides by a mature evergreen hedge with an open side facing the main A91 trunk road. 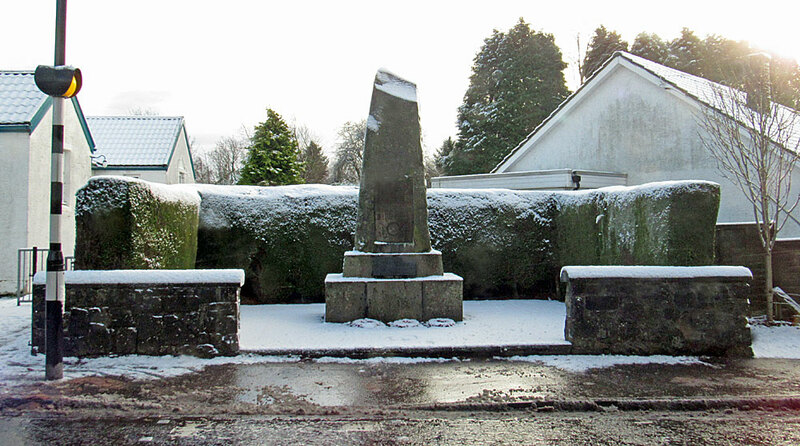 The memorial, which reaches a height of 14 feet, was unveiled in 1920 by Captain A P Haig and comprises a large irregular monolith stone of remembrance on a two-step concrete base. 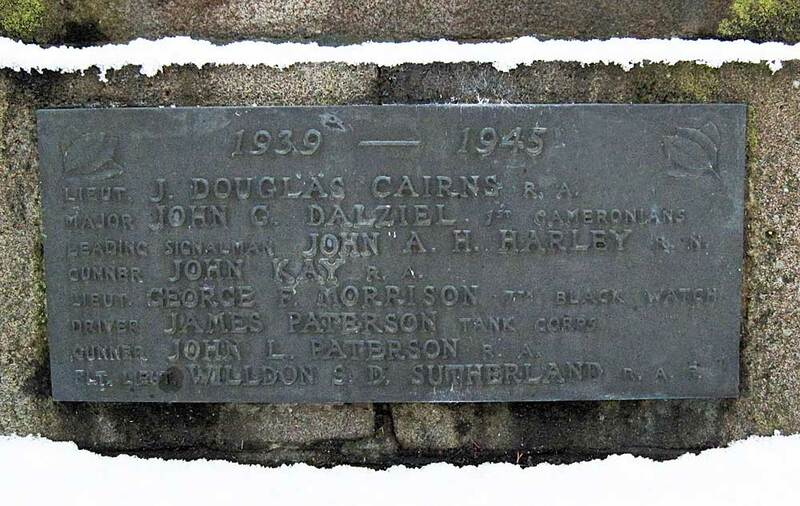 The World War One bronze plaque, with an embossed laurel wreath supported by flags, is set into the main stone with the World War Two plaque planted on the upper concrete base, each having raised lettering. The is constructed from whinstone sourced from the nearby Devonshaw quarry. 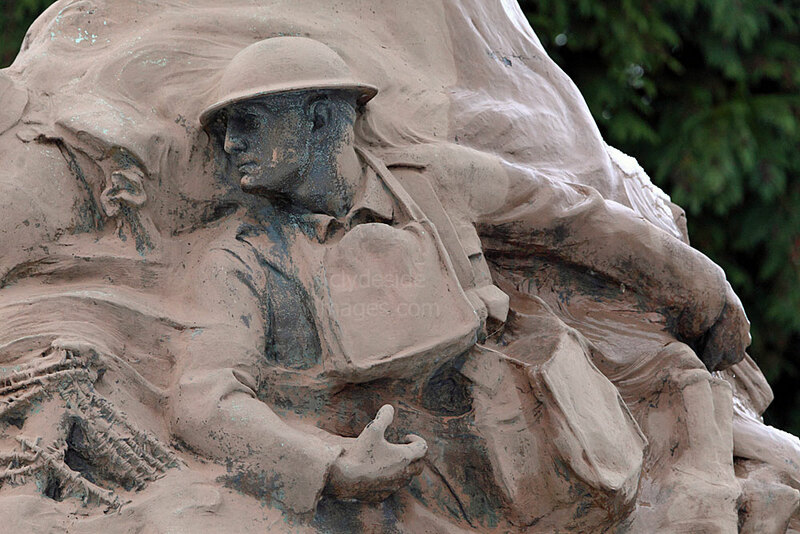 As mentioned in the Dollar entry above, the acclaimed Scottish sculptor and artist George Henry Paulin (1888-1962), more commonly known as Harry Paulin, was born here and it was he who created the village memorial. He was the eldest son of the Reverend George Paulin and the family home was the local manse. George Henry served during the Great War, initially as a trooper in the Lothian and Borders Horse Regiment, then with the Royal Flying Corps then the Royal Naval Air Service (RNAS) which became part of the newly formed Royal Air Force on 1 April 1918. 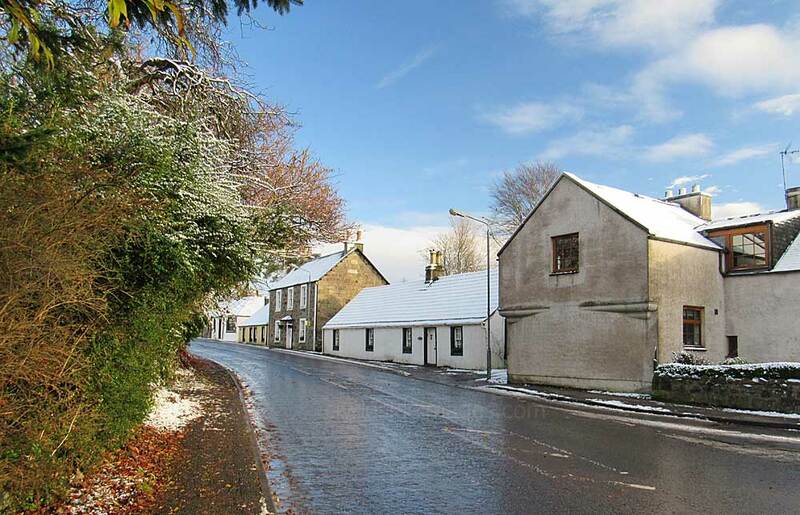 This town, often often referred to simply as "Tilly" by the locals, is another one of the Hillfoots Villages impressively situated at the foot of the Ochils which form an impressive backdrop, especially when covered in snow. 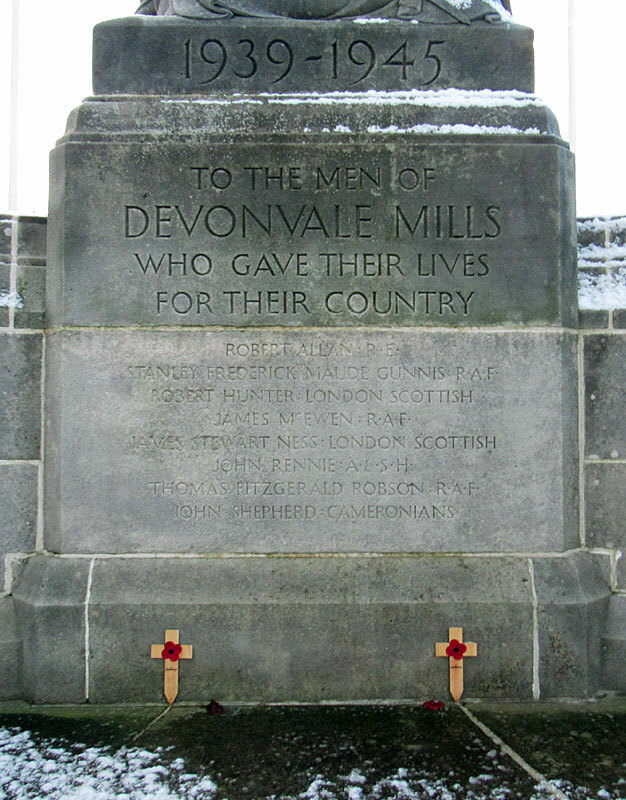 The town of course has its own Great War memorial which I`ve yet to photograph but there is an additional memorial at Devonvale Mills to honour employees who died during WW2. J&R Archibald began producing woolen fabrics at Devonvale Mill in 1846 but from 1914-1917, the complex became a barracks for the soldiers of the 53rd Gordon Highlanders, as wells as home to 800 horses. British Cotton and Wool Dyers took over after the military had left but in 1921 Samuel Jones & Co established a paper mill. From an initial workforce of 33, it grew within 10 years to 238 and by 1967 it employed around a fifth of the local working population. Following a takeover by British American Tobacco in 1970, paper making came to an end here in July 1972. 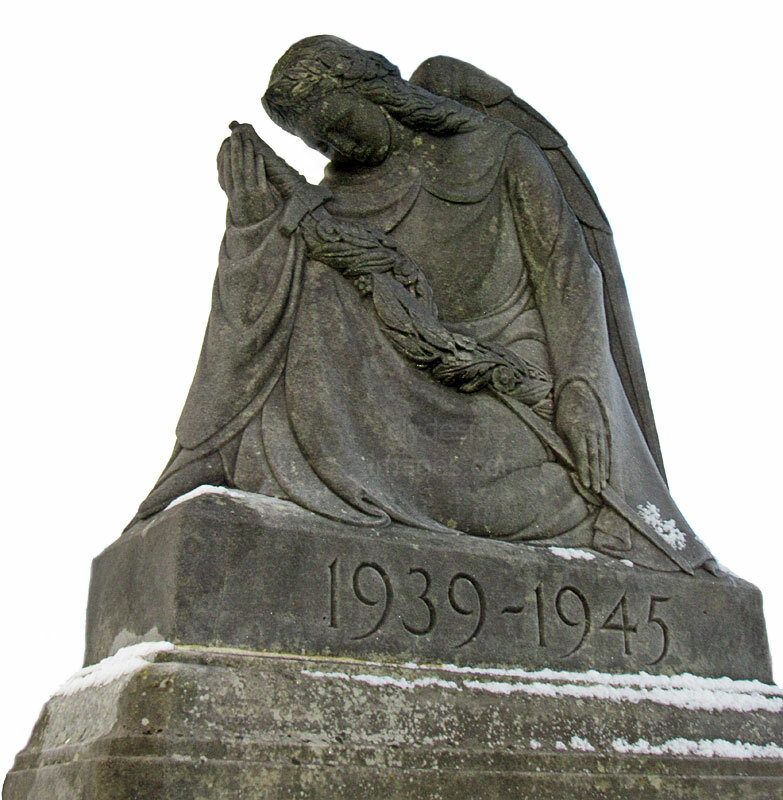 Located on the west side of Moss Road between the Sterling Furniture retail warehouse (formerly the Devonvale Paper Mill) and the Sterling Mills retail outlet, this memorial comprises a kneeling, weeping figure of a winged Angel of Victory holding a sword and wreath, sitting on top of a central stone plinth with inscriptions at the centre. A concave stone wall forms a backdrop and there are two pairs of wrought iron memorial gates on either side of the wall with matching end pillars. Each gate has a green and white thistle motif. 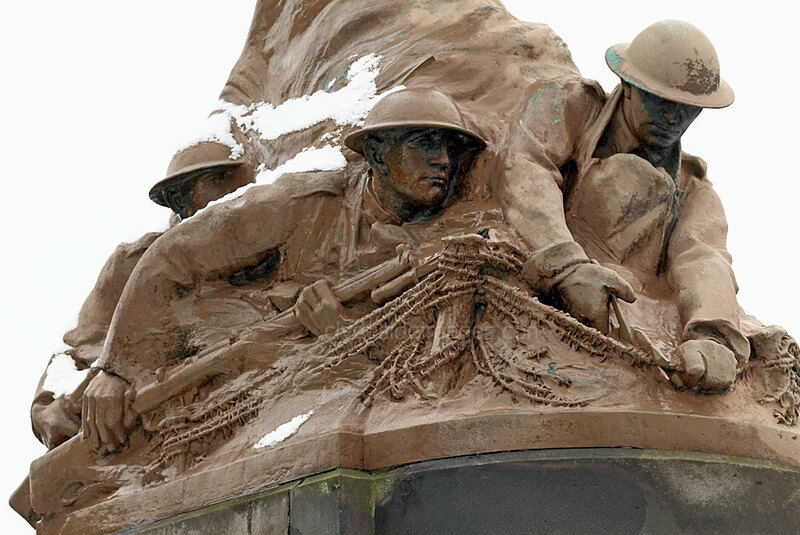 ​This memorial, commissioned in 1947, is another of many created by the renowned architect and sculptor Charles D`Orville Pilkington Jackson ARSA, FRBS, FRSA (11 October 1887 - 20 September 1973). 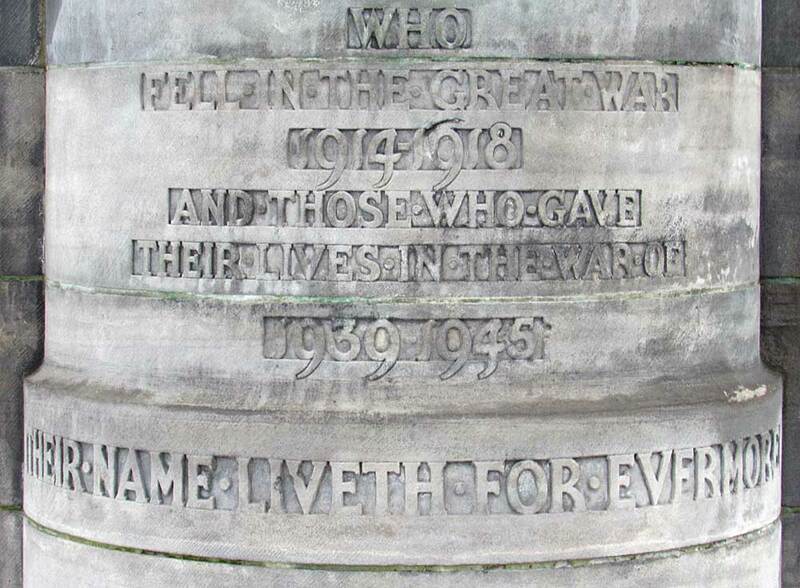 ​​Eight employees of Samuel Jones & Co, the Mill`s operator at the time, are commemorated here and at least six of these men are buried in Commonwealth War Graves at various locations including Sicily, Italy and the Netherlands. Others have no known grave. 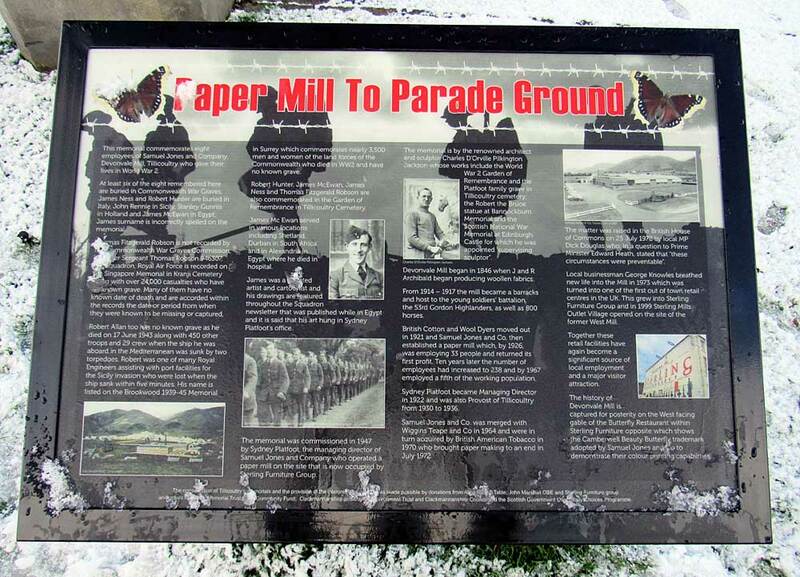 An information board includes additional details of the men who died serving their country as well as facts about the on-site industries.